Update: The Mail has paid Fletcher's invoice "with no admission of liability" and removed the plagiarised article from its website. Perhaps the people featured at the foot of this post might care to take up the cudgels? "Their name liveth for evermore," the engraving reads, but the words ring hollow. The stone on which they appear lies shattered in a foreign field that should be forever England, yet patently is anything but. So begins an exclusive article by Martin Fletcher for The Times about the desecration and neglect of war graves in Iraq. It was published on the newspaper's website at 1am yesterday. Fletcher, a former Times staffer who is now freelance, went to Iraq under his own steam, paying his way, organising his own transport, finding his own contacts, taking all the risks inherent in visiting that part of the world. Despite being etched with the immortal line: 'Their name liveth for evermore', the truth could not be further from the sentiment for the memorials in the Commonwealth War Cemetery in Amara. It came from the pen of Euan McLelland, who actually filed his copy at 4.02am, shortly after completing a story about the importance of teaching children phonics and as he prepared to report on outrage over plans to allow a police killer outings from jail. Apart from writing for the Mail, McLelland has a personal website on which he describes himself as a "driven proactive and reliable multimedia reporter". At 28, he is proud of his journalistic record thus far and says his job requires him to "consistently deliver hard-hitting and breaking news stories as they happen to a global audience". It certainly keeps him busy. His night shift on Sunday also involved writing about garlic that doesn't give you bad breath, an interview with Lee Rigby's mother, insight on SAS plans to attack ISIS and an update on the junior doctors' dispute. 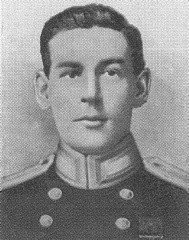 With such a workload, it is impressive that McLelland managed to research the background to one of the war heroes buried in the neglected cemetery - Lieutenant-Commander Edgar Cookson, above, who was awarded the VC after being killed, aged 31, while trying to clear a river blockage in September 1915. Unfortunately, McLelland rendered Cookson's first name as Edward and got his age wrong, but mistakes do creep in when you're working under pressure. The rest of his story bore a striking resemblance to that published on The Times website. More than 4,600 soldiers killed in Iraq during the First World War, three of them winners of the Victoria Cross, are buried in the Commonwealth War Cemetery in the southern city of Amara, but you would never know it. A century after they died for their country, their resting place is an unsightly expanse of mud, weeds and uncut grass the size of four or five football pitches. The smashed remains of the traditional Cross of Sacrifice are piled in the middle. Plaques naming the dead have fallen off the commemorative wall.The headstones were mostly removed in the 1930s because they were crumbling in the saline soil, but the gravemarkers, gatehouse, date palms and many of the perimeter railings have all disappeared. Most of the headstones were removed in the 1930s after they crumbled in the heat, leaving behind plaques, gravemarkers and several stone memorials.However, they too have now gone - leaving the cemetery a weed-peppered mud heap. Still, this cemetery has fared better than the adjacent graveyard for 5,000 Indian soldiers who died beside their British counterparts. That has been commandeered by the Maysan Funfair with its merry-go-rounds and giant ferris wheel, and by the construction company that built it. An neighbouring graveyard for Indian soldiers who died alongside the British has fared worse.With almost all of its memorials now gone, a funfair now operates on the formerly serene plot. It has also fared better than the British and Indian war cemeteries in Basra, 100 miles further south. The former really has become four of five football pitches, replete with goalposts. Hordes of boys now play on the graves of 2,906 British soldiers, including one VC winner. Worst of all, goalposts now mark as many as five football pitches on the once sacred ground, meaning scores of locals are now enjoying a kickabout on the final resting places of thousands of British war heroes. http://www.thetimes.co.uk/…/britains-war-graves-left-dusty-…I hardly think the perfunctory nod to The Times deep in the story justifies your plagiarism. In any other profession this would be called theft - theft of my story, of the research I financed, of all the time and energy I put into my journey to and around Iraq. I'd like to know whether you are intending to pay me for the use/theft of my exclusive story on British cemeteries in Iraq by Mail online yesterday? I am a freelance journalist. I paid my way to Iraq. I did the research. I put in the time and energy. I took the risks of visiting that unstable country. How dare you steal my work and pass it off as your own? How can you possibly describe yourself on your website as a "driven, proactive and reliable young media reporter". Are you completely without shame or pride? I sent an invoice to your publisher, Martin Clarke, yesterday, but he has not had the decency to reply (why am I surprised?). So I am sending it again - this time to you. Will his letters bear fruit? Others have shamed the Mail into paying up, but nothing seems to change. Clarke, overseeing the world's most successful website, appears bombproof. The Australian sued for plagiarism two years ago and ended up reaching an undisclosed settlement with Clarke. This time last year Jim King wrote a piece for Gawker entitled "My year of ripping off the web with Mail Online" describing his experiences working under Clarke in America. SubScribe readers responded to that with their own tales of life under the Clarke regime in New York. All water off a duck's back. In August 2014 when Isis drove the Yazidis up Mount Sinjar, the only journalist with them on the mountain was Jonathan Krohn, who was filing for the Sunday Telegraph. His copy went up in full on that paper's website and was then subsumed into a wider story for the print splash. It also appeared in the next day's Daily Mail, complete with picture byline. Krohn told SubScribe at the time that he hadn't authorised the Mail to use his work - although they had tried to contact him by text and email when he was out of signal. He fired off a legal letter and the Mail settled out of court. So he is living proof that the organisation knows that it can't steal copy with impunity. How many journalists who have had their work ripped off realise that? Fletcher's Facebook post on his tussle over the war graves brought a clutch of sympathy tales from other correspondents - and some stirrings that might just lead to a legal challenge in this country. The UK introduced something akin to the US style class action suit last october, intended mainly, from my shallow understanding, to allow for large consumer groups to pursue price fixing claims etc. An ambitious lawyer could easily see all the foreign corrs that have been ripped off by this despicable practice (it happened regularly to me and other colleagues when I was in China) as a single class of plaintiffs. There really is so much about IP theft that goes unpunished and unremarked upon, or worse, simply viewed as an inevitable feature of the new normal. The fact your Times article is behind the Paywall means it was not in general circulation on the internet. I assume you could have sold it or versions of it to several different publications at their usual rates and that having it available to everyone on the MailOnline could mean they are no longer interested or would pay significantly less. I would take this to the small claims court. Bill the Mail the maximum you could have anticipated in terms of syndication and secondary deals with photographs and/or video. I would also claim your expenses as though you had gone there to do the story for the Mail. I assume this could amount to quite a tidy sum of money. It would then be up to the Mail Online to defend your claim and argue why they thought it was okay to appropriate someone else's work from behind a subscription site and place it in the public domain, thereby depriving them of the product of their labour. This kind of theft would not be tolerated or allowed in any other industry. And the tragedy is that it all goes back to giving away copy online for free. by devaluing their own work to zero newspapers have signaled that it can be taken for nothing. Onion farmers don't give away their onions to create a market for onions. Sgt King's widow Monica told The Sun: 'It's disgusting. 'The 65-year-old added that her husband's killer was 'pure evil'. In an extract from her book Lee Rigby: A Mother's Story, serialised in The Mirror, Mrs Rigby also described how she thought she was having a heart attack when the two 'evil b*******' erupted in court after being told by a judge their views were 'a betrayal of Islam'. Maybe these journalists might care to join the Fletcher campaign? Oh yes, and in the way of old-fashioned (old-far) journalism, SubScribe emailed and tweeted Mr McLelland to ask if he'd care to comment. He has yet to respond. If he does, his words will appear here - or, if they're interesting enough, at the top of the post. I must admit I don't even really notice when the Mail rips me off these days; it's almost a badge of honour. It would be unfair just to single them out though. The Telegraph does it too, as happened recently with a story about ducks (we can't all do intrepid reporting from Iraq). What annoyed me wasn't so much the nicking of quotes, but the verbatim theft of whole phrases and the entire article structure. When the Gresley Society quickly modified the statue to accede to the family’s wishes, it could not have predicted the reaction. Some members took principled pro-duck stands and resigned. Others stayed to try to change it from within. A petition launched by the duckists has almost 3,000 signatures. Vanessa Feltz, the radio presenter, has declared herself “100 per cent pro-duck”. "Gresley's relatives were the first to oppose the idea, for reasons eloquently expressed by one of his grandsons, Tim Godfrey, who said: "It's a statue of a man, not a stupid duck." Instantly, the Gresley Society modified the design to placate them. But they couldn't have predicted the reaction: enraged by the decision and bewildered at the bird's absence, an army of pro-duck Gresley Society members started an uprising. Some resigned on principle; others remained to fight from the inside...So they turned to the public, launching a petition which has gained around 3,000 signatures. Radio presenter Vanessa Feltz has expressed her support, declaring herself "100 per cent pro-duck". To be fair to Euan, he does deal with a huge number of agency stories, and only the Mirror ever give agency staff bylines.